OK, great, thanks for answering all the questions. I think the best thing to do at this point is to obtain a UVSJ and rewire your system as I have shown on the bottom of the attached drawing. It will be real simple to do. You will be putting in the UVSJ where your combiner/splitter is currently located and replacing your distribution amp with the combiner/splitter (you can always put the distribution amp back in if you need to). You already have plenty of amplification with the preamps and the distribution amp might be overkill. I think the UVSJ has a good chance of resolving your problem. Last edited by Tim; 14-Apr-2019 at 11:59 PM. Thanks for all your patient help, Tim. Although there are 4 TVs, only 2 regularly watch OTA. My son watches the local news on a 3rd but that's all. I have 5 UVSJs ordered so will need to wait until they get here. Could I replace the 3414 with something like this; a 4 outlet non powered splitter so all TVs had antenna access? I really, really appreciate your help as well as everyone else. Yes, the 4 port splitter would work fine. The LNA200 uses a power inserter, but the LNA100 does not use a power inserter. The USB power for the LNA100 goes directly into a connector on the amp housing. Some UVSJs pass power on the UHF side and some pass power on the VHF side. The Radio Shack and Antennas Direct UVSJs pass power on the UHF side. My guess is that the ASKA only passes power on the VHF side. The location of the power inserter for the PA18 is critical. It might be necessary to use the ASKA UVSJ after the power inserter for the PA18. I don't know what power inserters are. 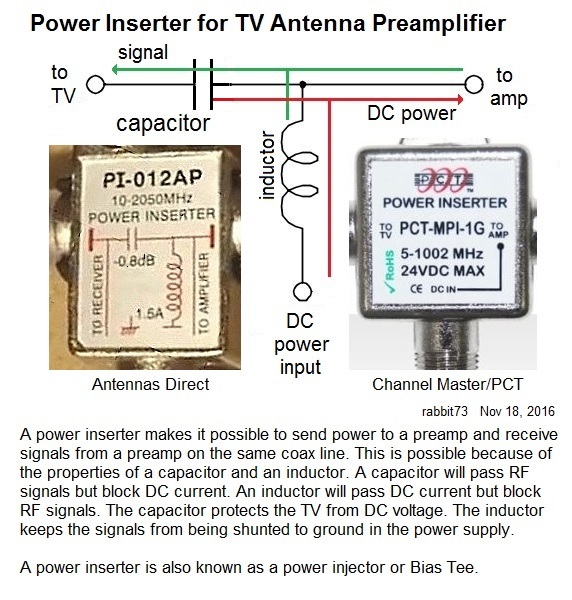 A power inserter is a device that allows you to put the preamp close to the antenna and the power supply inside out of the weather. The coax that carries the signal down from the preamp also carries the DC power up to the preamp. Last edited by rabbit73; 15-Apr-2019 at 2:04 AM. I believe Tim's diagram shows the UVSJ after the power inserters for both leads. I have revised the diagram to show the 4 port splitter. Rabbit73's post just made me wonder something. I have an Antennas Direct Combiner. Also located my second PA 18 preamp. Would the Antennas Direct combiner work and not need the UVSJ? I would put the Pa 18 pre amp on my VHF and eliminate the Winegard. Yes, please get back to us after you've done that work. for me I'm interested to see how pre-amping the signals before combining them works. If it doesn't work try combining with the UVSJ and then pre-amping them after. Last edited by bobsgarage; 15-Apr-2019 at 2:03 PM. Thanks for the fast reply, Bob. Here's what it says on the site. This all-weather antenna combiner merges the signals from a UHF antenna with a VHF antenna on the same cable. Coaxial cable sold separately. The DC power pass on the UHF port allows for UHF-only amplification in special circumstances. For example, when UHF signals require amplification, but the VHF signals may not. Or your household has an existing amplified antenna, but also needs to add a separate VHF antenna that doesn't need amplification. Last edited by rabbit73; 15-Apr-2019 at 3:25 PM. A UVSJ physically looks live a splitter but works very differently. It has an input marked UHF, another input marked VHF and a Line output. I would not count on it being a UVSJ unless it is specifically marked as such. The UVSJ has a very specific function and is used when you want to combine UHF signals from one antenna with VHF signals from another antenna. A UHF antenna will receive some VHF signal. The UVSJ filters out the VHF component from the UHF antenna. A VHF antenna will receive some UHF signal. The UVSJ filters out the UHF component from the VHF antenna. Since you have signals being received on two antennas, the signals may arrive at each antenna at a slightly different time. When combined together they may offset each other and lessen the total amount of signal making it weaker. Using the UVSJ, when it combines the signals from the two antennas, there are no competing signals that will mix with each other and cause signal degradation. I am not clear as to how Blackstone is powering his preamps. If he can explain that to us, I will add it to the diagram. Referring to your original drawing, Tim. The UHF antenna has the Antennas Direct PA 18 preamp on the mast. The power inserter is before the splitter/combiner inside. The VHF antenna is using the Winegard preamp. Using Rabbit73's explanation above for the LNA 100, it is also on the antenna side of the splitter/combiner. "With only the channel master, I get no UHF stations. Looks like you were picking up your high VHF stations with no problem using the LNA100 amp. If it's working don't change it. Don't confuse UVSJ and combiner. They perform completely different functions. The UVSJ will hopefully isolate your two antennas from each other and eliminate the signal degradation you are experiencing. Using a combiner to combine two antennas usually does not work well. Blackstone, in an earlier post you said you had the PA18 mounted on the mast of the DB8E and then 3 ft of cable connecting the preamp to the splitter/combiner. You also said the splitter/combiner was in your basement. Can you confirm that the 3 ft of cable is correct? That just doesn't seem right to me. The PA 18 is connected to the DB 8E with a 3' cable. Thanks for clarifying the UVSJ.